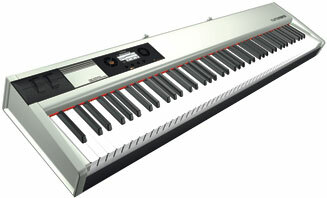 TP/100LR: Professional Digital Piano Keyboard. Through the development of a new kinematic force-scheme, the research and development of techno-polymer materials, determines a major strength of the key and more precision in its response. The musician therefore obtains a better dynamic control of the action applied on the key and on the hammer (Hyper Dynamic System®). The new PCB design improves the signal contact, increasing the dynamic range and the new connection system is supplied (Fast Connection System®). A special lock-in system (Support Block System®) allows to use the frame of the keybed as a support for mechanical parts, making easier the development of the final instrument. Editing is handled by the Easy Control System with a backlit LCD display and touch-sensitive pads. Play Mode gives you direct access to the most important parameters - perfect for quick changes on stage. What‘s really unique about the NUMA is the so called You- Play Mode, which allows you to create your own velocity curves and save them to 15 presets. These customized curves are available to every patch then. Due to the integrated USB connection, the NUMA can com- municate with a computer. It offers two modes of operation: With USB MIDI the NUMA is recognized as a „USB-Audio- Device“ by the computer. More interesting is the USB Virtual Com mode, enabling the computer to edit and store presets. Even an update of the NUMA operating system is possible.